(b.1643-r1707-d.1712) was also known as Shah Alam I. He was the eldest son of Aurangzeb. He became emperor in 1707 after a brief struggle against his brothers, Prince Azam and Prince Kambaksh. He inherited a kingdom in upheaval from his father, Aurangzeb, with many vassal states rebelling. He tried to bring about peace in the polity with his more liberal approach, and, unlike his father, he followed the Sufi Islamic tradition. Bahadur Shah succeeded in making peace with the Marathas and the Rajputs, but his achievements are not highlighted because of his short reign. Bahadur Shah was a old man when he ascended the throne and his reign barely lasted five years. Jahandar Shah (b.1661-d.1713) succeeded his father, Muazzam, after a fight against his brother, Azim us Shan (Azim us Shan was earlier credited for having fought successful wars against the Sikh general, Banda Bahadur). The conflict ended with Azim's death. 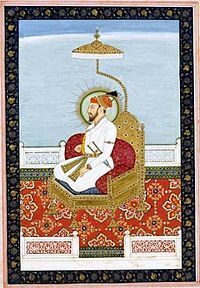 Jahander Shah could rule only for eleven months (1712-1713) before being killed by Farrukhsiyar, the son of Azim us Shah, who then declared himself emperor. (b.1685-d.1719) ascended the Mughal throne in 1713. He was assisted in this process by the Sayid brothers - Sayid Husein Ali, who became the wazir, and Sayid Abdullah Ali, who became the commander of his army. As a result the Sayyed brothers gained a lot of influence in the court of Farrukhsiyar and with time tried to control Farrukhsiyar. Farukhsiyar also had long-standing trouble with the Sikhs which led to the capture and death of their general, Banda Bahadur, and his associate, Baz Singh. Eventually this spurred the Sikhs on to form their own kingdom. Farukhsiyar was also instrumental in allowing the East India Company trading rights in Bengal. Farukhsiyar was a highly insecure person and his constant intrigues alienated his nobles as well. He tried to break the shackles of the Sayid brothers, but they deposed him with the help of the Marathas (even their court rival Nizam ul Mulk and other nobles abstained from helping Farrukhsiyar) and installed his cousin, Rafi ul Darjat (son of Jahandarshahs brother Rafiurshah), on the royal throne. Farukhsiyar was imprisoned and allegedly poisened at the behest of the Sayid brothers. (d.1719) was another short term puppet emperor in the hands of the Sayid brothers. He was briefly and unsuccessfully challenged by his uncle Nikusiyar. He died in 1719, after enthroning his brother Rafi ul Daulat to the Mughal throne (some sources say Rafi ul Darjat died by slow poisening by the Sayyids after Rafi ul Darjat at times tried to disregard the Sayyids). Rafi ul Daulat (d.1719) brother of Rafiuldarjat, was the third puppet of the Sayid brothers lasting not even a year.He too died by an an alleged illness. Nikusiyar (d.1743) son of Muhammed Akbar (son of Aurangzeb who had rebelled against him) served as the nominal sovereign. He was propped up by a local minister. Muhammed Shah (b.1702-r1719-d.1748) was the grandson of Bahadur Shah I (and son of Jahanshah, brother of Jahandarshah). He ascended the throne in 1719 with the help of the Sayid brothers, but later turned the tables on them and removed them in a coup. During his reign many smaller kingdoms cropped up. In 1739, Nadir Shah of Persia invaded and looted Delhi. He even carried away the famed 'peacock throne', and the Kohinoor and the 'Darya e noor' diamonds with him, leaving Muhammed Shah humiliated. racted) after having been made the emperor at the age of 23. He was murdered in his sleep by his vazir, Imad ul Mulk Gazi ud din (grandson of Nizam ul Mulk). His son, Bidar Baksh II, temporarily rose to power in 1788 as a puppet of Ghulam Qadir. (b.1699-r1754-d.1759) son of Jahandarshah. He ruled for six years from 1754-1759. He was also installed by Gazi ud din. The Marathas, in collaboration with Gazi ud din, consolidated their power in the north during his reign. In 1756, the Afghan, Ahmad Shah Abdali, invaded India and plundered Mathura. Aziz ud din was murdered in 1759 by Ghaziuddin after the latter intercepted a letter from the emperor to Ahmad Shah Abdali imploring Abdali to rescue him from the clutches of Ghaziuddin. or Muhi ul millat, was a Mughal emperor for a very short time. He was the grandson of Aurangzeb. He was placed on the Mughal throne in 1759 but subsequently deposed by the marathas in 1760. In 1759, Delhi was briefly captured by the Marathas. Shah Alam II (b.1728-r1759-d.1806) was also known as Ali Gauhar. He was the son of Alamgir II. As a prince he was completely under the sway of the vazir, Gazi ud din, but to break away he escaped from Delhi and tried to establish himself in Bengal. Upon his father's assassination by Gazi ud din, he declared himself emperor. 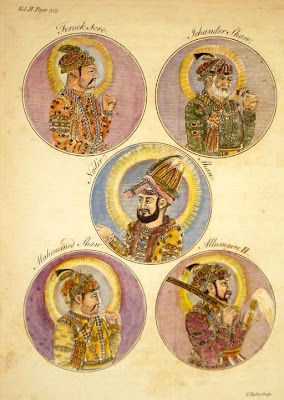 He was under the East India Company's patronage for a long time, until the Marathas, who had occupied Delhi in 1771, invited him to become the emperor in Delhi .Note, Shah Alam II was also the acceptable choice of Afghans and Abdali who had gained control of Delhi post 1761. Under his able general Mirza Nazaf Khan (who was later to be sidelined), Shah Alam II marched towards Delhi. On the way he had successes against the Afghan Rohillas and the Jats, collecting huge revenues from them. He also launched several attacks on the Sikhs, but being a poor judge of character he chose some unsuitable people to lead the Mughal army. They colluded with the Sikhs, forcing a Mughal retreat. Shah Alam, realising the indispensable nature of his general, Mirza Najaf Khan, again invited him to lead the Mughal forces. But after Mirza Najaf's death, Shah Alam once again relied on the old traitors. This wrecked the Mughal empire from within. The Marathas too had evacuated Delhi. Sensing an opportunity, the Afghan Rohillas marched on Delhi in 1788, but financially, Delhi was already bankrupt. Finding nothing to loot, the Afghans blinded Shah Alam II just before the Marathas returned to save him and drove away the Rohillas. The blind emperor ruled for some time, but it was evident that the Mughal empire was a pale shadow of its former self. Akbar Shah II (b.1760-r1806-d.1837) replaced him in the same capacity. 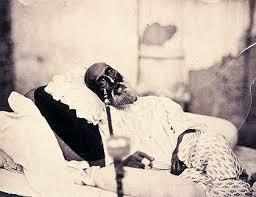 Bahadur Shah Zafar (b.1775-r1837-d.1862) was the last Mughal emperor, and was the son of Akbar Shah II. He was a old man when he ascended the throne, and was better known as a poet than an emperor. He patronised famous poets and writers of his time such as Mirza Ghalib and lived on a pension offered by the East India Company. When the sepoy mutiny of 1857 took place, the rebel leaders urged Zafar to let the rebel forces unite under his banner. After the failure of the mutiny, Zafar was imprisoned by the British and exiled to Rangoon (Burma), where he died. His departure marked the end of three centuries of Mughal rule in India.